We offer precision manufactured Semi Automatic Filling Machine with Telescopic Filler System. The machines are manufactured from high grade quality raw materials suitable for various applications. These machines can be used for packing a vast variety of products such as ORS powder, tablets, spices, grain, pulses, salt, sugar and tea. Our Automatic Filling Machine is known for their compact and simple design and variable speed drive, which is optional. Moreover, these require less power to operate and can be easily used by laymen. 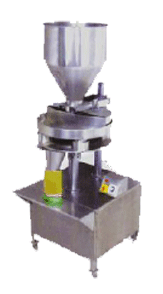 We proffer very affordable rates for these sturdy semi automatic filling machine. Easy to Operate & Maintain. Speed 6 to 25 Fills Per Minute.